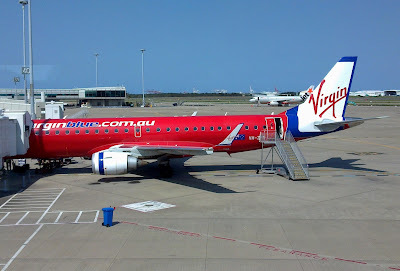 As I was out at the airport to see the last flight of Virgin's E190 VH-ZPG I thought I would spend the morning taking a few photos. Below are just a few of the 145 photos that I took. YIT WAS INSTRUCTED BY TOWER TO DO "GO ROUND"
On the 2nd of February at approximately 8.50am Virgin Australia's Embraer ERJ 190 VH-ZPD (CN 1900176) with the Callsign Velocity 9901 departed Brisbane for the very last time; as it was heading off to Nashville USA via Apia, Honolulu and Van Nuys. Well today it was ZPG's turn to head over the big ditch; and once again with the Callsign Velocity 9901 VH-ZPG (CN 19000195) departed at 8.23am and started heading to Nashville via Apia; Honolulu and Van Nuys. ZPG was the seventh of eleven aircraft ordered and it was entered into the Australian Aircraft Register on the 23rd July 2008. ZPG's first revenue flight was from Brisbane on the 26th September 2008 but unfortunately after an hour of searching I cannot find where it went to. Just heard on the television that Qantas will buy back $500 million of shares after lower fuel prices, strong demand for international flights and ongoing cost cutting placed the airline on course to report a record full-year profit. Qantas has recorded its best first-half underlying profit before tax of $921 million, at the upper end of its guidance range, and unveiled a $500 million on-market share buyback program. Alan Joyce (Qantas CEO) also said they have plans to roll out free high-speed Wi-Fi on all Qantas domestic flights, with trials starting by the end of 2016 using a 737. Passengers will be asked at the end of the flight to complete a small questionnaire and if things like 'people where using skype' and it was annoying kept coming up then skype would be blocked. My wife asked me this morning "what are we dong tonight" and I said nothing why... and her reply was "I want to go to the airport for a while and take photos of Etihad and Emirates".... so around 4.30pm I packed my family up in the car and headed out to the airport..Am I a lucky man or what!!! Upon arrival we noticed a Fiji Airways B737 parked at the logistics apron; then we remembered we heard earlier that day that due to Cyclone Winston, a Category 5 cyclone heading towards the Pacific Island of Fiji, all Fiji Airways flights have been cancelled until further notice.